Fraser's photinia (Photinia x fraseri, also labeled P. fraseri) is commonly called red tip, a nod to the bright-red color of new foliage. This fast-growing shrub is common throughout the South and Southwest, where long summers encourage the shrub to put on 2 to 3 feet of new growth each year. Unfortunately, a fungal leaf spot disease in the South infects red tip, limiting its usefulness. Brightly colored new foliage gives red tip its common name. Red tip is a common evergreen shrub used for foundation plantings, hedges and screens, particularly in the South. 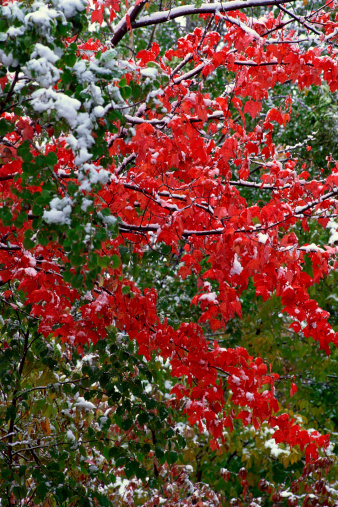 New foliage is a brilliant red lasting for two or three weeks before the leaves change to dark green. Fraser's photinia adapts to many different soil types and exposures. If not infected with Entomosporium leaf spot, red tips live for 50 to 150 years. Red tip is hardy in U.S. Department of Agriculture plant hardiness zones 7 through 9. Red tips are very fast-growing shrubs, attaining 24 to 36 inches per year. They quickly reach their mature height of 8 to 15 feet. Width is one-half to two-thirds the height on unpruned shrubs. Red tips grow in almost any soil in full sun or light shade. They're less prone to disease and have more intense, red coloration on the new growth in full sun. Feed them lightly in the early spring before new growth begins. Prune red tips only while dormant in the winter. Pruning while they're in active growth forces a new flush of foliage that's especially vulnerable to fungal disease. 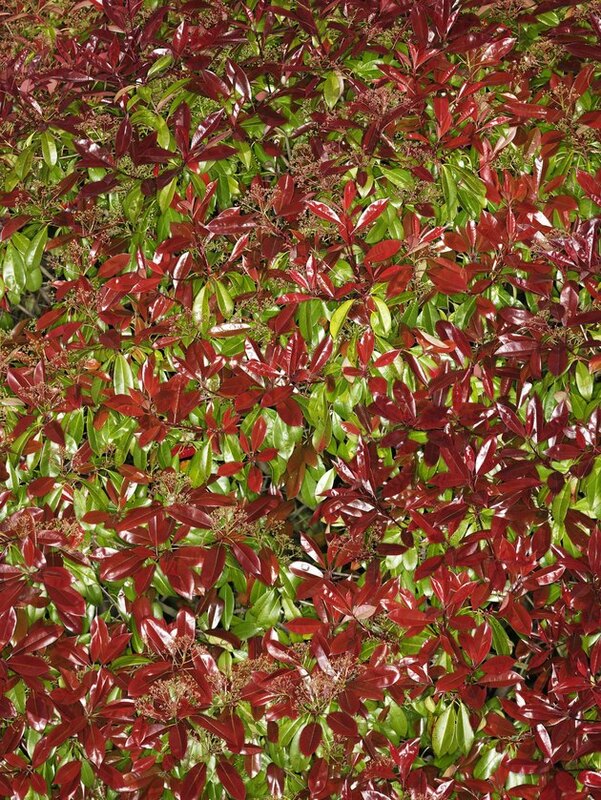 Fraser's photinia is susceptible to a leaf spot disease caused by the Entomosporium fungus. Red, circular spots on both the upper and lower leaf surfaces characterize this disease. The spots join into larger, maroon blotches. The disease is most prevalent on new growth and during cool, damp weather. The disease is less common in the Southwest, where low humidity keeps the fungus in check. Entomosporium leaf spot spreads by fungal spores landing onto the leaf surface, so it's important to keep the area under your red tips clear of fallen leaves and debris. There are several fungicides available to control the disease, but you must commit to a regular spraying schedule for them to be effective. If your landscape is unsuitable for red tips, or if you don't want to spray fungicides in your garden, other shrubs are good substitutes. Several species of holly (Ilex spp.) are fast growing and have a similar size and shape, including the Koehne holly (I. x koehneana), Burford Chinese holly (I. cornuta "Burfordii") and the Emily Bruner hybrid (I. x "Emily Bruner"). Japanese Cryptomeria (Cryptomeria japonica) and the Atlantic whitecedar (Chamaecyparis thyoides) cultivars Rachel and Emily are also fast growers with a similar silhouette. Japanese ternstroemia (Ternstroemia gymnanthera, also labeled as Cleyera) has the same red new foliage as red tip. Marie Roper began writing in 1987, preparing sales and training materials for Citadel, Inc. and then newsletters for Fullerton Garden Center. A trained horticulturist, she was a garden designer and adult-education teacher for the USDA Graduate School in Washington, D.C. Roper has a Bachelor of Arts in history from the University of Maryland. What Is the Rate of Growth for Dogwood Trees?